All of our inns at Bed and Breakfasts of the Historic Shenandoah Valley are located close to some of the best trout waters in the country. The fishing season is year round in Virginia. These streams vary from smaller pristine mountain ones flowing out of the Alleghany Mountains to the West of the Shenandoah Valley and also including ones flowing out of the Blue Ridge Mountains to the East to larger rivers and spring creeks in the Valley. Many of the colder mountain streams are home to Virginia’s state fish, the Eastern Brook trout, native to these waters. Native Brookies are at the top of the scale when measuring trout beauty. These cold water beauties can only survive in clean 70 degree water temps and below. The Shenandoah National Park in the mid to northern Valley East has many streams which hold them. The Allegheny mountain streams to West have good numbers of these Brookies in Bath, Allegheny, Augusta, Rockingham, Rockbridge, Shenandoah and Highland Counties. The state of Virginia also has many hundreds of miles of Special Regulation. Delayed Harvest and other Wild Trout water that it manages throughout the Shenandoah Valley and surrounding mountains. Colorful and hard fighting Rainbow, Brown and Brook trout make up most of the trout populations in them. Some of the more famous ones are the Jackson River, Mossy Creek, Passage Creek South River Buffalo Creek, St. Mary’s River, North River, Cowpasture River, Bullpasture River, North Creek, Big Back Creek and Roaring Run to name a few. Regulations, stream locations and licensing requirements may be reviewed on this website, which features a brand interactive trout stream map and app that be loaded from anywhere. Areas 1, 2 and 3 are where most of our trout streams are located. There are several flyshops located in the Valley, all have daily or weekly fishing updates South River Flyshop in Waynesboro, Mossy Creek Flyshop in Harrisonburg and Murrays Flyshop in Edinburg. All of these offer guided trips and instruction. 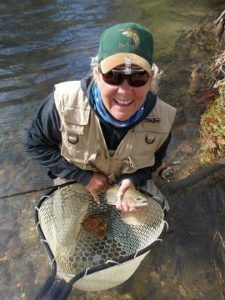 Vatrout.com is located in Lexington and offers both introductory fly fishing trips and other Trips for all skill levels. A great way to experience these beautiful streams is to sample more than one and stay in one or several of our fine bed and breakfasts of the Historic Shenandoah Valley along the way. Finish off you day in comfort with us, all of our innkeepers will be happy to help you on finding a nice restaurant close by as well as giving you local advice on exploring some of the best small towns in America. More on trout fishing in the Valley: www.vatrout.com.